On Inequality: What Exactly Are We Trying To Do Here? From the State of the Union to Janet Yellen to countless articles (1, 2, 3, 4), income inequality has emerged as a defining part of American political and economic discourse. For all of its negative effects on the social and moral (not to mention economic and political) identities of America, it is little wonder that there are calls for a “fix” to income inequality. However, I was struck by the ambiguity of the word “fix”. What does success look like? Can we fix it if we don’t know what the goal is? To find out, I surveyed 40 people that I reached through Twitter, Facebook, and email (the survey). The results, while admittedly unscientific, were surprising. The respondents tended to reflect my peer group: educated young professionals working in finance, economics, or education. I recognize that this sample is too small and selected to represent the population but if anything, this sample should over represent those interested in the topic with the know-how to understand what the heck we’re talking about. The first surprise was how unconfident the respondents were. 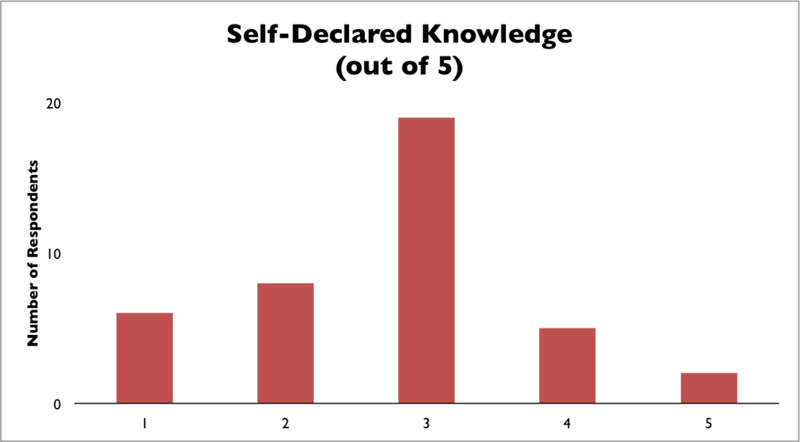 Only 17.5% rated their knowledge a 4 or 5 out of 5, while about half gave themselves a 3. My guess is that if this non-random group, of all groups, is either uneducated on the issue of feels uneducated, then the general population must be even worse. We are not able to confidently speak on the issue, which can be changed, but is not an encouraging sign to leaders hoping to awaken a movement immediately. The second (and biggest) surprise is that there is no consensus on what success looks like. I asked what the ideal income distribution looks like. For the most part, the respondents agreed that no one should be poor, but that’s where the similarities stop. 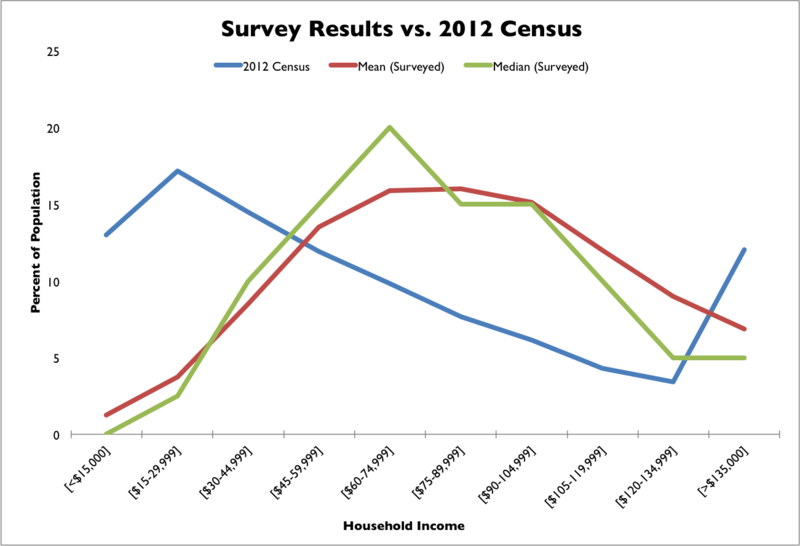 After about $45,000 in household income, respondents quickly diverged. Some wanted everyone to be rich while others wanted to retain some inequality (I fall into the second camp- I’d like income as an incentive for work once basic needs are met). The diversity of responses signals that even within a group of seemingly similar people, there is yet to develop an agreement of where we should point the ship. 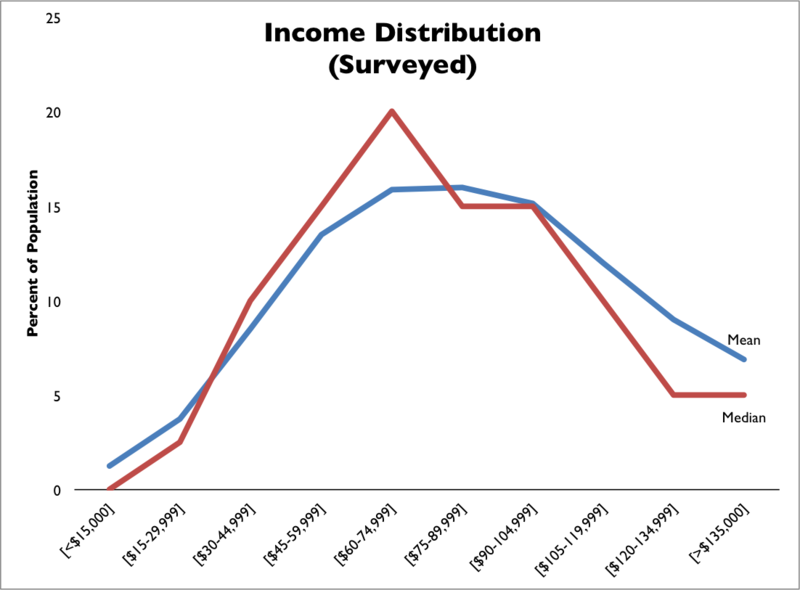 There also was no significant relationship between how knowledgeable respondents reported they were and the likelihood of them putting most or all of the income in the top four income brackets. Nevertheless, there is a general perception that income is too unequal now. I compared the survey results to the actual US household income distribution in 2012 (Table HINC-06): respondents wanted fewer households at either extreme overall. In 2012, 13% of US households earned less than $15,000 while the mean ideal was 1.25%. At the other extreme, 12.5% earned more than $135,000 while the mean ideal was 5%. Census data from CPS Survey Table HINC-06. Downloaded 2/12/14. There is little disagreement that income inequality is a problem. Almost everyone wants something to change. Figuring out what should change and to what end, however, is a bit more complex. As the Saint-Exupèry saying (now clichè) goes: “if you want to build a ship, don’t drum up the men to gather wood, divide the work, and give orders. Instead, teach them to yearn for the vast and endless sea.” The issue with income inequality is that we all yearn for different seas. The full set of responses (excluding comments) can be found here. Some issues I recognize with this survey include a small non-random sample, limited response options, limited and inexact income/wealth brackets, a the lack of the “household” qualifier in the questions. I’d love to hear what you think about income inequality, the survey, or the analysis, so don’t hesitate to reach out.